We decided to take a long weekend trip from Pattaya to Hua Hin, a few days after the New Year. The Pattaya-Hua Hin ferry was about to start service. They were even offering free passage for the first week or so. We (wisely) decided to give it a pass until the reviews came in. So, we drove. From what I have heard, the ferry has had to cancel trips when the water is too choppy. Just bear in mind that if you’re planning a trip, you may not be able to count on getting to your destination when you planned. We ended up driving using our trusty GPS. The trip took about five hours including rest stops and coffee. We stayed at the G. Hua Hin Hotel and Mall (about 10000 baht for three nights for two people) It’s a nice hotel with an excellent breakfast buffet. The room was spacious and well appointed. However, they say they’re 200 meters from the beach. Maybe as the crow flies, but you’d have to cross a highway and then walk down a long soi. If you want to be close to the beach you should stay on the other side of Route 4, Hua Hin’s main drag. As a waterfront resort, Hua Hin has an abundance of beachside restaurants serving delicious, fresh seafood. Many are connected to adjoining hotels such as the Sailom which served succulent Thai dishes and was quite reasonably priced. You can’t walk very far without spotting all kinds of food establishments with various price ranges. As Hua Hin is on the other side of the Gulf of Thailand from Pattaya, the water and beaches are similar. There seems to be more open space on Hua Hin’s beach, although there are also chair concessions where you are obligated to buy food if you want to sit there. There are smaller concessions where you can sit at a table and enjoy a beer or snack. 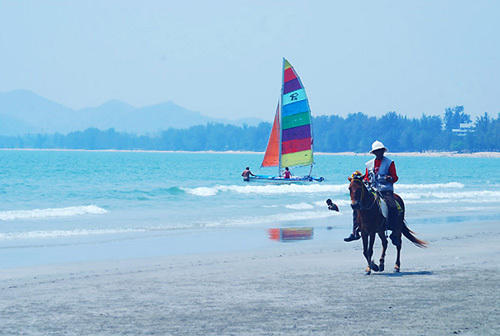 Uniquely, Hua Hin Beach offers horseback riding. The attendant will lead you up and down the beach or if you’re more skilled, you can ride on your own. You can access the beach by walking past the many beach front hotels or use the entrance to the public beach at the end of Soi Hua Hin 61. Amazingly, the entire three days that we were in Hua Hin, were overcast or drizzly (not a ray of sun the whole time). It didn’t dampen our getaway too much, but we did feel the need to find some other activities. If you’re looking for tourist traps (eh, attractions), Hua Hin has an abundance of them. The Hua Hin Safari (basically a misnomer) is a park offering elephant, tiger and crocodile shows; each for a separate charge. They also rent ATVs (the safari?). To get there, the GPS took us part of the way on unpaved mountain roads. Not for the faint of heart. The place itself didn’t offer much except the aforementioned shows. 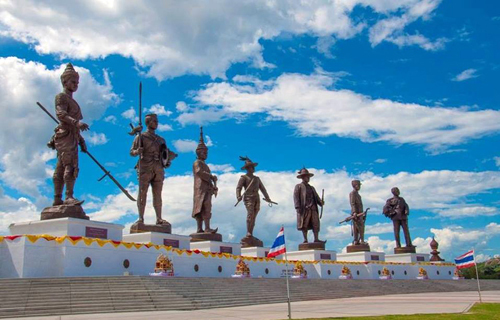 A bit more worthwhile is The Seven Kings Monument in Rajabhakti Park, Phetkasem Rd. The park contains seven giant, bronze monuments honoring seven great monarchs. It opened less than two years ago. Highly recommended is a quick look at the Hua HinRailway station. It was originally constructed in 1911 and rebuilt in 1926. Don’t miss the old Baldwin steam locomotive that’s on display. 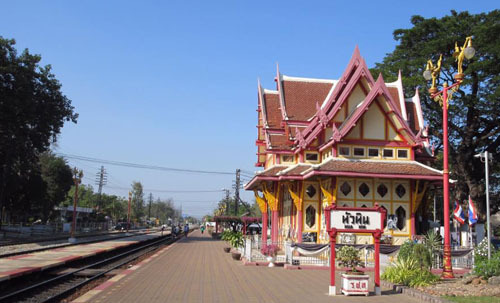 The Victorian Hua Hin station is surely the most beautiful in Thailand. If it’s shopping you crave, you won’t be disappointed. There are a myriad of shopping opportunities in Hua Hin, from malls to themed markets and, of course, the venerable night markets so popular in Thailand. 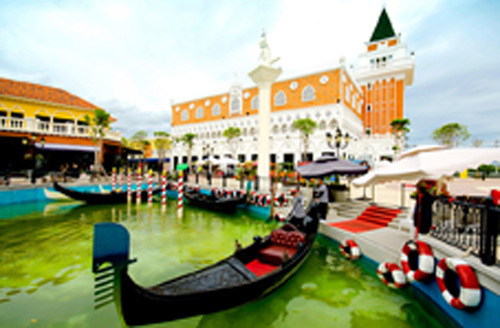 Venezia is a Venice themed attraction between Hua Hin and Cha Am. It impresses as a good idea that didn’t really reach its potential. Lots of shops and businesses seemed to be shuttered. They do offer a gondola ride on the smallish ‘canal,’ horse and buggy rides and a ‘train ride,’ among others. There are various shops selling T-shirts and other items as well as some themed restaurants. On the complex is an upside down house. I imagine if you’ve been to the one in Pattaya (I haven’t) you can skip this one or vice versa. Honestly, I just didn’t get the point. Furniture, etc. is nailed, upside down to the ceiling. Then on your phone ap, you can turn the picture around so it looks like you’re standing upside down. Well, each to his own I guess. The 3-D art museum was kind of interesting. You could put yourself in front of various pictures and objects and it looks like you’re white water rafting, standing in front of the Golden Gate Bridge and so on. 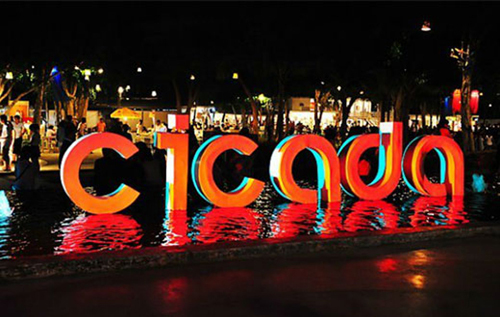 Cicada Market is open on Friday and Saturday nights. It’s an attractive, up scale, open air market offering various kinds of arts and crafts, as well as, clothing and other items. There’s also an amphitheater featuring various performances of dance and theater. They even provided us an umbrella as it was drizzling. I really didn’t understand the performance we saw as it was all in Thai. However I did enjoy the dancing, singing and costumes; and especially the shirtless young men. If you get hungry, you’ll find the obligatory food court as well. 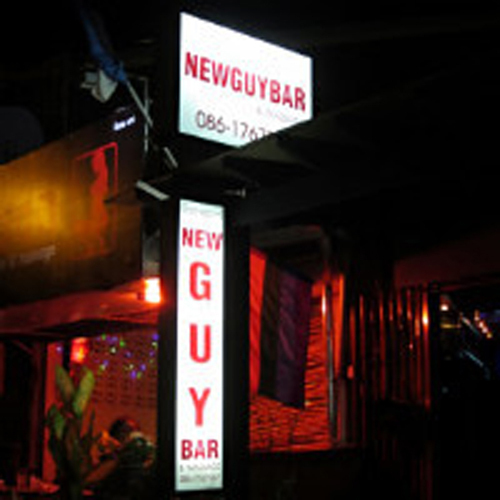 Saving the least for last, is the gay night life in Hua Hin, or lack thereof. The two gay bars I’m aware of are both on Hua Hin Soi 61. Red Indian has been around a long time. It’s at the end of the soi near the beach. It’s a small venue with a few tables. The night I was there it was pretty quiet, but I’m told it gets crowded at times. New Guy, which is larger, also offers massage and has pool tables. If you’re looking for a vibrant, gay scene a la Pattaya or Bangkok, you won’t find it in Hua Hin. That said, there are a plethora of non gay venues offering various libations, live music and food. There are several right outside of Cicada Market. Hua Hin is definitely a more laid back option compared to Pattaya. If you haven’t been there, I definitely recommend giving it a try. If you take the new ferry, let me know how you liked it.